The kitchen is the heart of your home, where you gather with your family to make delicious food and sit down with long-time friends to catch up. The room can be a place to cook dinner and the spot where the kids do their homework, and it’s important to have the proper lighting in each area. At The Light Center in Fort Collins, we can help you choose the right kitchen lighting for your home, and we have a great selection in our showroom. Many modern kitchens incorporate an island for the additional counter space, and to create a central focal point for the room. Some islands have a sink where you can wash those vegetables that you bring in from your garden, while others offer seating for those Saturday morning family breakfasts. When it comes to your island, it’s imperative to have the right light fixtures, and pendant lights are often the most popular choice. 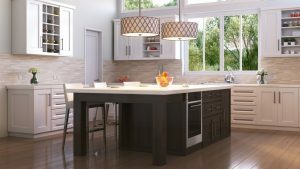 A single pendant fixture with multiple lights could be the best option, but depending on the size of your island, you may need individual pendants to adequately light it. You’ll want to space out the pendants across the length of the island, and make sure the lights are on their own control switch. Ambient lighting refers to the general lighting solutions in a room, and when it comes to the kitchen, there are a few options from which you can choose. A small chandelier can be a great choice, while other homeowners may opt for a flush-mount fixture. Recessed lighting can also look good in a kitchen, but you’ll want to be sure that it’s not the only ambient lighting solution you choose. Recessed fixtures can help increase the spread of light across the kitchen, but they can also make the room look and feel unfinished and uninviting. When you’re in the kitchen making dinner, you’re likely standing at one of the counters. You need to be able to see as you’re chopping and mixing ingredients, and that’s where under cabinet lighting comes in handy. Your body is likely blocking some of the light from the ceiling, and having fixtures under your cabinets gives you the illumination you need. You can also leave a few of them on at night, when the ambient and pendant lights are off, and create an inviting glow throughout the room. 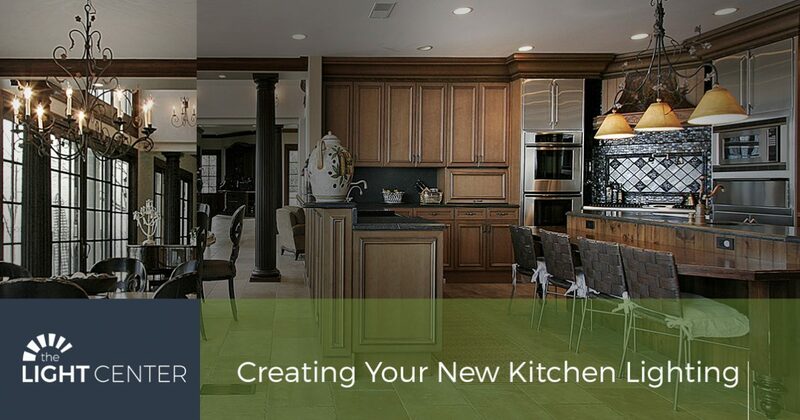 If you’re redesigning or remodeling your kitchen, and you’re searching for new lighting options, then visit The Light Center in Fort Collins today. Our showroom staff will gladly show you a number of great kitchen light fixtures, and can answer your questions about design, layout, and more. To get started on your project, you can fill out the contact form below, or you can call us at (970) 530-4388. Our showroom hours are Monday through Saturday from 9:00 a.m to 6:00 p.m., and we’re always happy to help however we can.